Samantha: Well, relationships are not always about being happy, right? I mean, how often do you feel happy in your relationship? Samantha: You feel happy every day? Charlotte: Not all day every day, but every day. I once asking myself what did Charlotte mean by saying that. But then I know what is the meaning of that statement. Once I have Mas Bromo here with me, I know I will no longer be alone facing every thing; happiness, sadness, bluntness, stupidity and all. I know how it feels to be happy every single day, yet not the whole day every day. But, yes. I am happy. I always have something to be laughed at, have things to be argued about in a good or silly way and can even feel love in the resentful feeling, every single day. 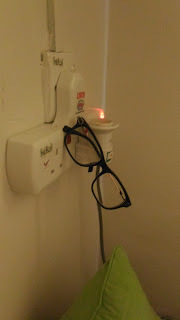 Even this morning, I smiled at his glasses which unexpectedly hung somewhere there :) Anyway. I really wish we can do good everyday, take care of each other and respect one another.